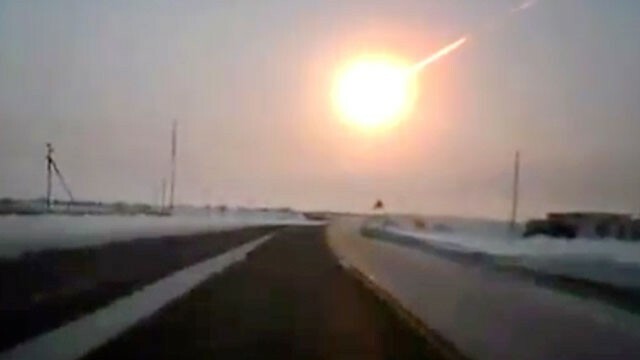 Remember the meteor that exploded over Russia earlier this year? A 50 foot diameter object exploded 14 miles above the surface of the earth and created a shock wave that injured 1500 people and damaged more than 7000 buildings. Despite the drama, the lasting effects on the earth were minimal and only small pieces of the meteorite made it to the surface of the earth. Now imagine tens to hundreds of objects up to several thousand feet in diameter impacting the earth’s atmosphere at one time over hundreds of thousands of square miles. That would be catastrophic. Could that happen again and what would be the consequences for life on earth? Well, not only could it happen, there is increasing evidence that just such an event did happen in the not so distant past. No, I’m not talking about a giant impact that likely responsible for the demise of the dinosaurs or the crater that sits below the Chesapeake Bay or the one in Arizona. I’m referring to the YDB impact event of course. Never heard of it? Probably not, but the idea received some attention six years ago and has slowly been attracting more interest as the evidence mounts for what may have been the most recent catastrophic event in earth’s history. From Murray Springs Arizona we see a section showing the YDB (Younger Dryas Boundary) layer (dark line) that marks boundary between the sediments bel0w and the Younger Dryas sediments above. This material at the bottom of this dark line dates to 12,800 years ago. What is found just under the dark line are magnetic grains and microspherules, iridium, soot, and fullerenes all indicative of a significant extra-terrestrial event. At this exact site very early native American Clovis artifacts, a fire pit, and an almost fully articulated skeleton of an adult mammoth were recovered just below the black line. Excavations by Vance Haynes, Jr., and colleagues also revealed hundreds of mammoth footprints in the sand infilled by black mat sediments. These footprints and the mammoth skeleton appear to have been preserved by rapid burial after the YDB event (1). No in situ Clovis points and extinct megafaunal remains have been recovered from the black mat/line or above the black sediments, indicating that the mammoths and Clovis hunting technology disappeared simultaneously. 1. Haynes CV, Jr (1987) Centennial Field Guide Volume 1: Cordilleran Section of the Geological Society of America (Geolog Soc Am, Boulder, CO), Vol. 1, pp 23-28. All the way over in Belgium, here is an example of a YDB. Again, there is a clear line marking the boundary between sediments deposited in the Younger Dryas vs those before. The black line in this has been shown to date the SAME dates as those in North America and includes the same glassy spherules, iridium, and ash from plants burning that is found and many other locations. This is supplemental Figure 9 from the 2013 PNAS publication cited in the references. Why is this boundary so distinctive in the geological record? There is considerable evidence that climate change is responsible for the change in materials that are deposited above the YDB line. These deposits represent a time after the last ice age in which the world was warming fairly rapidly but then suddenly stopped warming and got cooler again for a short time. But what caused the climate to change? There has been numerous hypothesis including; changes in global circulation patterns in the North Atlantic ocean due to ice sheet melting,volcanism induced cooling, super novae explosions etc..
A more recent idea has been hotly debated in the scientific literature, but I believe is now poised to attract more followers, is that the earth had a catastrophic encounter with a meteor or meteors which, at the very least, had a dramatic effect on the short term climate if not kicking off the global cooling trend that would last hundreds of years. A paper, Evidence for deposition of 10 million tonnes of impact spherules across four continents 12,800 y ago, just published by PNAS reports the most extensive analysis yet of glassy spherules found at the Young Dryas boundary (the YDB) in the geological column. The authors report some very compelling evidence that this YDB was the result of a large meteor impact with the Earth’s atmosphere about 12,800 years ago. What does the YDB impact hypothesis propose happened 12,800 years ago? The authors propose that 12,800 years ago a series of meteors, likely a chain of broken pieces of one meteor, entered the earths’ atmosphere at a very oblique angle over a period of hours or days and exploded in the upper atmosphere much like the Chaybliska meteor in Russia earlier this year. However, these were much larger meteor fragments probably 1000s of feet in diameter. The shock wave of these massive explosions occurring in many locations, mostly over North America, would have created so much heat as to locally vaporize the exposed ground and other materials on the surface of the earth creating mushroom clouds of molten rock and ash. The vaporized material would have cooled quickly and millions of tons of tiny spherules created that then were dispersed by winds and settled back to earth to be preserved eventually in what we see today at the YDB. At the same time the impact shock wave would have triggered massive continent-wide forest fires that also created huge amounts of ash that are also seen in the YDB at many sites. It is proposed that after this event massive erosion of exposed soils would have formed the deposits that are seen on top of the YDB in many locations resulting in differences you can see in the pictures above. What is the evidence that supports this extraterrestrial encounter at the YDB? 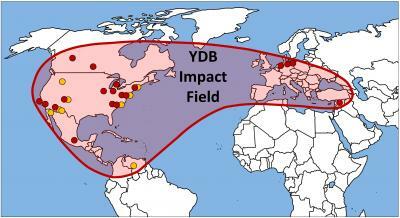 Range of sites for which the spherules have been found at the beginning of the Younger Dryas boundary. The full geographic distribution of spherules has yet to be determined so the map above is the minimum area impacted by a potential meteor explosion. 1) High abundance of microscopic spherules of various compositions. These are concentrated right in the YDB at all 18 studies sites with very few found in the rock above or below. These are found over much of the northern hemisphere and thus a single local event would not be able to explain their presence. 2) They produce evidence from the literature to show that these spherules could only have been produced by temperatures above 2200 degrees Celsius. Even intense forest fires would not produce the heat necessary to make these and they performed experiments burning wood in ovens to test if they could reproduce these spherules and could not. 3) The spherules come in many different compositions that are related to local abundance of source rocks. For example the spherules found in Syria and Arizona have different compositions but they match the types of elements in rocks in the areas suggesting it was the melting of the local rocks that was the source. This supports the idea that there were multiple meteor explosions causing many local blast sites that then distributed spherules in one geographical region (this still might have covered thousand of square miles. 4) High levels of iridium in the YDB. Iridium has been found in other proposed meteorite impact layers such as the crater that is implicated as being related to the extinction of the dinosaurs. There are no reasonable hypotheses proposed to date to account for a sudden spike in iridium over such a vast area other than an extraterrestrial encounter. 5) Some sites have nano-diamonds in the YDB. These small diamonds form under huge pressure and temperature and are known to have been formed in large meteorite impacts. While they can be found naturally due to earth’s processes, they are rarely found in these rocks and soils except in the YDB suggesting a specific event caused them to be there. 6) Critiques in the past have pointed out that volcanoes and lightning can produced similar spherules and that cosmic dust raining down on us also can produce these. The authors here counter the critiques by doing more research to show that above ground atomic blasts in Nevada were able to vaporize the surface soil at >2200C and produce nearly identical spherules. Lightning also produced extreme temperatures and forms small amounts of spherules each year. It might be possible there was a sudden occurrence of billions of extreme lighting strikes in a short period of time but even if that explained the spherules and maybe plants ash in the YDB it wouldn’t explain the nano-diamonds. It is true that space dust that enters the atmosphere does create some spherules that then settle onto the earth. These are found throughout the geological column but are very uncommon. What we have here in the YDB are hundreds or thousands of them per kg of material vs 1 per hundreds of kilograms of normal soils produced by space dust. 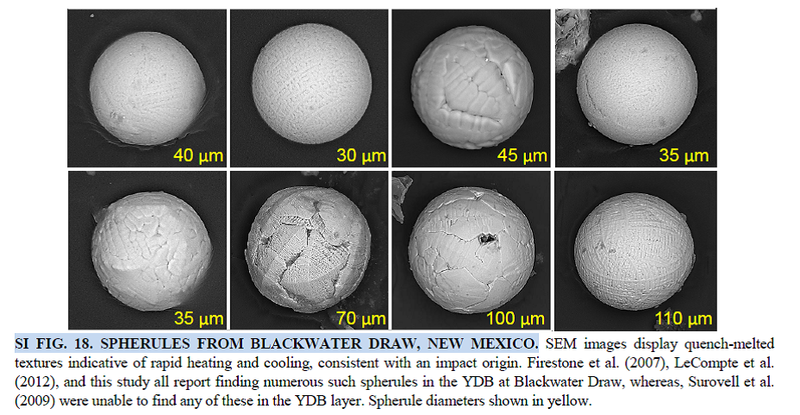 Examples of spherules found in just one YDB location in New Mexico. These were taken by scanning electron microscopy. If this happened so recently where is the meteorite crater that resulted? This has been a criticism of other paleoclimatologists (ancient climate scientists) and geologists since the first major publication proposing this idea in 2007 (see references). Firestone and colleague have countered that there may be small craters yet to be found but that there also may be no craters at all as this could have all been atmospheric explosions with only small fragment reaching the earth. In the case of the Russian meteor explosion earlier this year if there had been no eye-witnesses we would have no idea this event ever occurred because it left not scar on earth or enough particles to reconstruct its history. Only a very large event would leave enough material behind or caused enough damage to make reconstruction of the historical event possible. Another possibility is that the main part of the meteorite struck the ice sheet that covered much of North America at the time thus minimizing the impact to the earth’s surface. I think it is safe to say that this theory will always encounter a certain amount of skepticism as long as no evidence of impact is found so the road to winning over the majority of geologist will take an abundance of additional circumstantial evidence. If this was an atmospheric explosion how could it melt rock? I am sure that most people will find the idea that an explosion 10 miles high or more could vaporize the surface of the earth hard to believe. It might seem unimaginable but physics and chemistry tell us that this indeed can happen. Witnesses in Russia reported that not only did the shock wave they experience blow out windows and push walls down but they could feel the heat from the explosion. Remember this explosion took place more than 14 miles high in the atmosphere and shown brighter than they sun. Furthermore, an atomic bomb exploding above the surface of the Nevada desert vaporized the surface of the earth drawing up melting rock into the mushroom cloud and dispersing spherules over some distance. Did you know that North America had it own lion roaming the plains? The american lion was very similar to the African lion. Sabertooth tigers, lama like camels, lots of elephants. North American lost almost all of its large animals at the beginning of the Younger Dryas or during that time. A bit sad that we have so few animals alive today compared to past times. Could this loss have been caused primarily by an extraterrestrial event rather than human hunting? 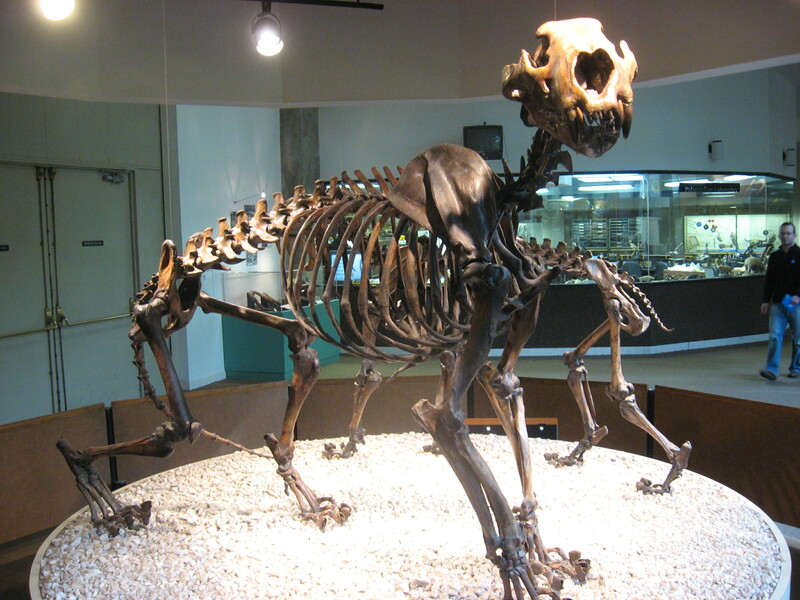 Above is a skeleton of the american lion. If these explosions vaporized the surface of the earth how did anything survive? Although these spherules are found over 100s of thousands of square miles it doesn’t mean that all of North America was vaporized. Possibly there were a few 10s of meteor fragments that exploded over North American. For the area immediately beneath these places there may have only been small areas that were vaporized while hundreds of square miles that were completely scorched. Further away form the epicenters, say 100 miles, the land could have been left relatively untouched other than possibly some secondary fires and a layer of fine soot. Many animals and plants would surely have been killed instantly but there would have been many large and small areas were they would have survived and from which the scorched areas were repopulated. The fact that many large animals appear to have gone extinct right at this time finds an explanation in this event because the largest animals would have had a more difficult time recovering in a landscape where most of them died instantly and the ones left had much less to eat for many years. So the these explosions might not have killed them immediately but kicked off climate change that did them in over a relatively short period of time. There is some evidence as well, that much of the megafauna was already on the decline before this event possibly due to hunting and the meteor explosion might have just been the thing that pushed them over the edge. What effect did this have on people? This is the big question. In North America there are many well-known archaeological sites for the so-called Clovis culture. These were the earliest native Americans. They left a distinctive set of stone tools and other artifacts and yet this culture disappears at the same time all over North America from Florida to Ohio to the southwest. The YDB marks the last time that Clovis culture artifacts are found anywhere! 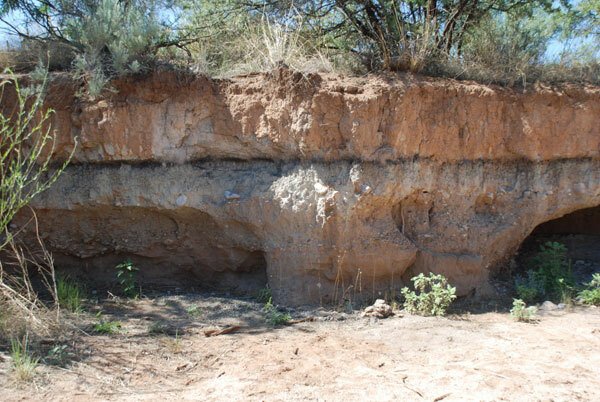 The first picture of a site in Arizona is a dramatic example of this. This site is a large archaeological dig where thousands of items of a Clovis-culture settlement are found but the black YDB line is the last time any are seen. Did massive extraterrestrial explosions wipe them out? Well, it probably didn’t kill ever single one of them but it probably did kill large numbers of people and with the change in habitat including loss of big game (another theory for the loss of large animals in NA is that the Clovis people killed them thus contributing to their own demise) this may have resulted in the decimation of the Clovis people in just a few years. Native Americans in Central America likely escaped the major effects of this catastrophe and over time migrated back up into North America replacing the Clovis culture with new Native American culture that are recorded in the archaeological record. Similarly in Europe and the Middle East people were probably impacted but not all killed. People are able to adapt more readily to environmental changes. In the Middle East the YDB makes a significant change from hunter-gatherer to more agriculture. The YDB impact event hypothesis is a good example of how science works. In 2007 Firestone and colleagues at multiple institutions proposed the YDB impact in a high-profile journal (PNAS). At the time they said that their ideas could explain some strange features of the YDB that other researches had reported. Nonetheless, to propose that there was a massive semi-global scale catastrophe that either directly or indirectly resulted in the extinction of hundreds of species and changed the climate of the whole globe for hundreds of years after was a radical idea flying in the face of several other popular hypotheses for similar observations (eg. extinction, soil profile changes, climate change, nearby supernova explosion). Any new and radical idea should not expect to be suddenly accepted by everyone and it wasn’t. In the years after 2007, multiple papers in high-profile journals by well-known scientists came out criticizing the conclusions of Firestone. Some said that they couldn’t find the spherules and other reported that there were other possible explanations for the presence spherules, nanodiamonds, plant ash and iridium. Today, there is still much disagreement in the scientific community about the what caused the YDB line, how much the climate changed, and what was the cause of the extinction of many species at this time. What is NOT of any debate is that there is a boundary line found all over the world in sediments of this age, that the age of this line is the same everywhere and that the last known appearance of many lineages of large animals is right below this line. These are the facts of the case, it is the interpretation of the facts that are debated. I said that some scientists initially reported in publications that they could not find the spherules reported by Firestone in 2007. That no longer seems to be the case as at least 8 independent researchers have now been able to identify similar spherules in the the YDB at some of the same locations that Firestone examined and at other locations that Firestone had never seen. Prior to this publication, I would still characterize the general palaeoclimate/geological community to be skeptical of the YDB impact hypothesis but this new PNAS paper should go a long way to causing some to reassess their thinking. The data appear quite compelling to me albeit I am not an expert in this area. However, even if Firestone and colleagues (there are 30 of them representing professional scientists around the world) aren’t exactly right about how this event occurred, it does seem that they have a valid hypothesis that must be taken seriously going forward. Clearly some significant event is recorded for us in these sediments and that event must have been extremely unusual. It isn’t as if no one thinks that nothing exception happened at this point in history. Another hypotheses to explain extinctions and this break in the geology is that there was a close supernova that hit the northern hemisphere centered on North America and fried most of the life there and caused massive wildfires. That theory is older than the YDB meteor theory but has not gained any favor because supporting evidence in additional research was found wanting. If you follow this blog you know that I frequently comment on how research such as I report above challenges the story of young earth creationists. I decided to just give you the science story first this time and save the commentary for later. In a future post I will consider how this data present a very stiff challenge to the YEC timeline and their views of post-flood migration patterns. Here is the abstract to this paper: Airbursts/impacts by a fragmented comet or asteroid have been proposed at the Younger Dryas onset (12.80 ± 0.15 ka) based on identification of an assemblage of impact-related proxies, including microspherules, nanodiamonds, and iridium. Distributed across four continents at the Younger Dryas boundary (YDB), spherule peaks have been independently confirmed in eight studies, but unconfirmed in two others, resulting in continued dispute about their occurrence, distribution, and origin. To further address this dispute and better identify YDB spherules, we present results from one of the largest spherule investigations ever undertaken regarding spherule geochemistry, morphologies, origins, and processes of formation. We investigated 18 sites across North America, Europe, and the Middle East, performing nearly 700 analyses on spherules using energy dispersive X-ray spectroscopy for geochemical analyses and scanning electron microscopy for surface microstructural characterization. Twelve locations rank among the world’s premier end-Pleistocene archaeological sites, where the YDB marks a hiatus in human occupation or major changes in site use. Our results are consistent with melting of sediments to temperatures >2,200 °C by the thermal radiation and air shocks produced by passage of an extraterrestrial object through the atmosphere; they are inconsistent with volcanic, cosmic, anthropogenic, lightning, or authigenic sources. We also produced spherules from wood in the laboratory at >1,730 °C, indicating that impact-related incineration of biomass may have contributed to spherule production. At 12.8 ka, an estimated 10 million tonnes of spherules were distributed across ∼50 million square kilometers, similar to well-known impact strewnfields and consistent with a major cosmic impact event. Boslough, M., et al. (2012), Arguments and evidence against a Younger Dryas impact event, in Climates, Landscapes, and Civilizations, Geophys. Monogr. Ser., vol. 198, edited by L. Giosan et al. 13–26, AGU, Washington, D. C., doi:10.1029/2012GM001209.